If you are looking for creative vision board ideas, try our Vision Tree instead! We’ve all heard of a vision board. We propose a Vision Tree instead. 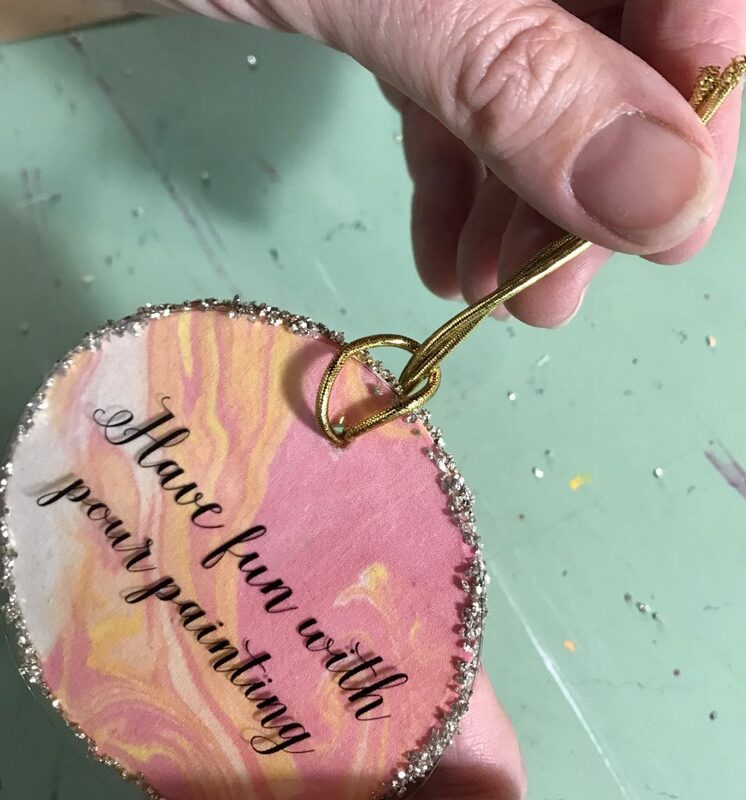 Aside from being a beautiful centerpiece and conversation starter, it’s a wonderful way to keep focused on your goals and the positive things in your life! Courtney and I have an ever-growing mountain of ideas for the coming year. It’s turned into a tsunami of goals. Where to start? 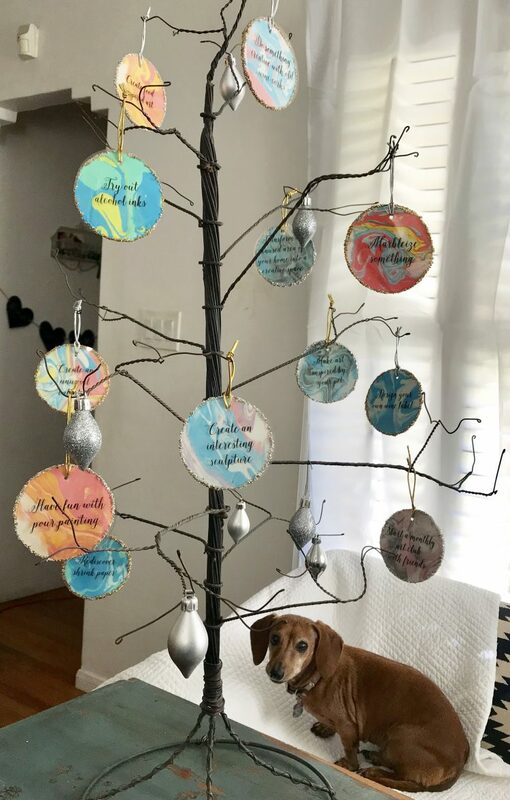 We decided to translate our creative vision board ideas into a beautiful Vision Tree. 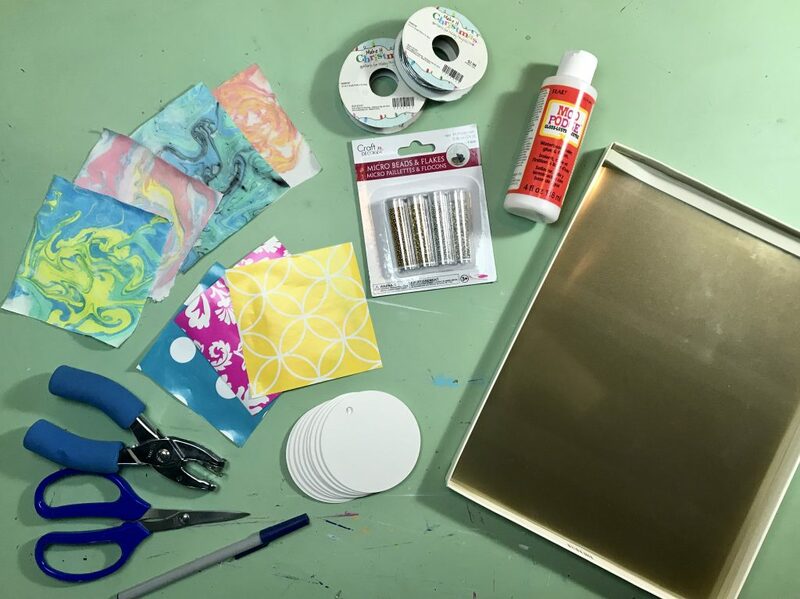 You can use decorative papers, felt, or whatever strikes you. 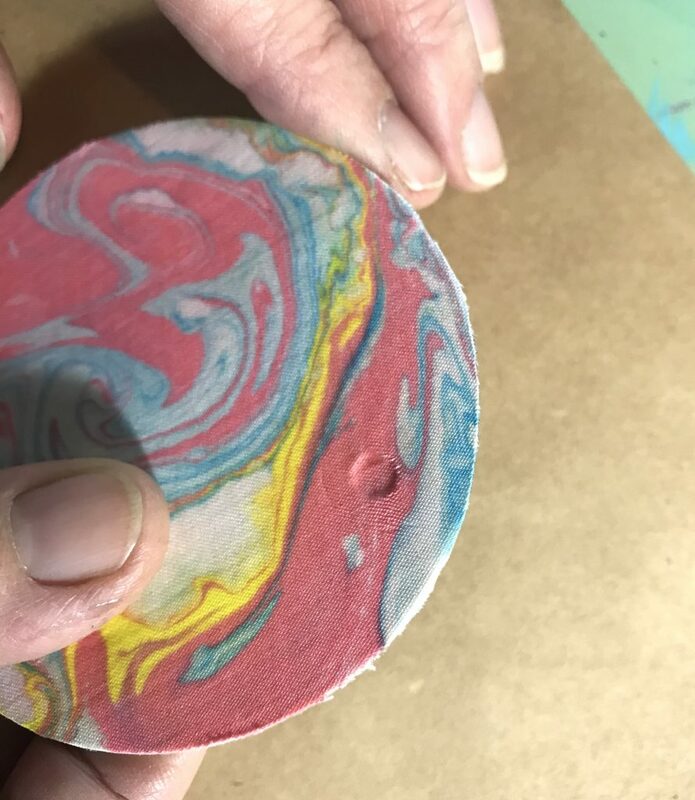 We chose to marbleize fabric for this one. 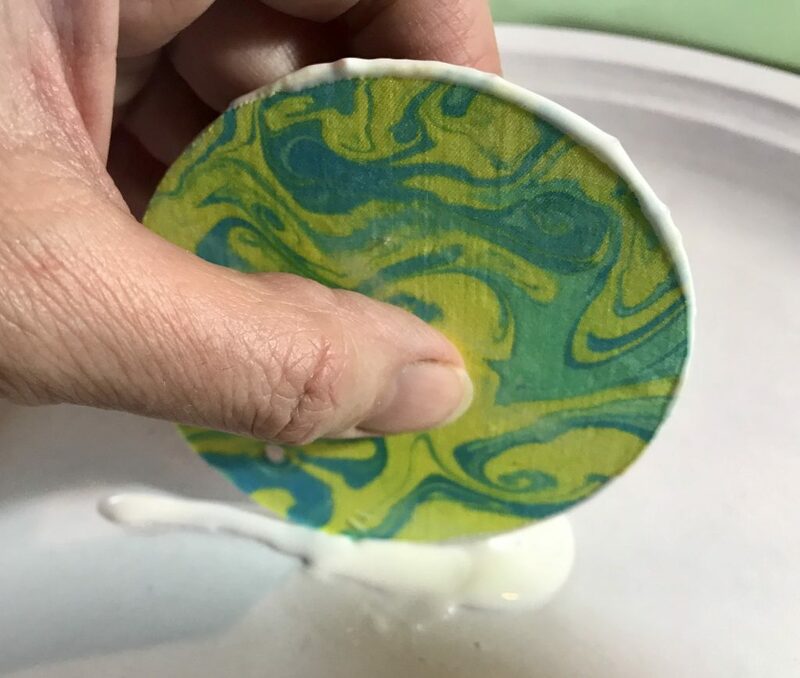 It’s so easy and fun, we’d love to show you how to marbleize. 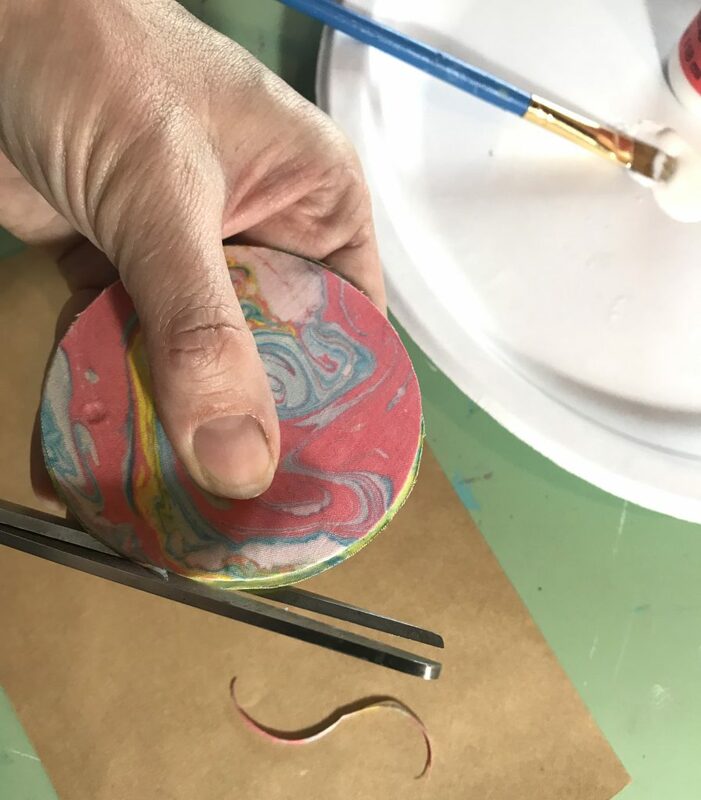 The overall effect of the marbleized design with glittered edges reminds me of jewelry I’ve seen in Sedona. So pretty! We can’t wait to begin the challenge of creating all the ideas on the tree! Before you begin: Decide what you want your tree to represent. Is it your goals, inspiring quotes or names of loved ones with special messages? 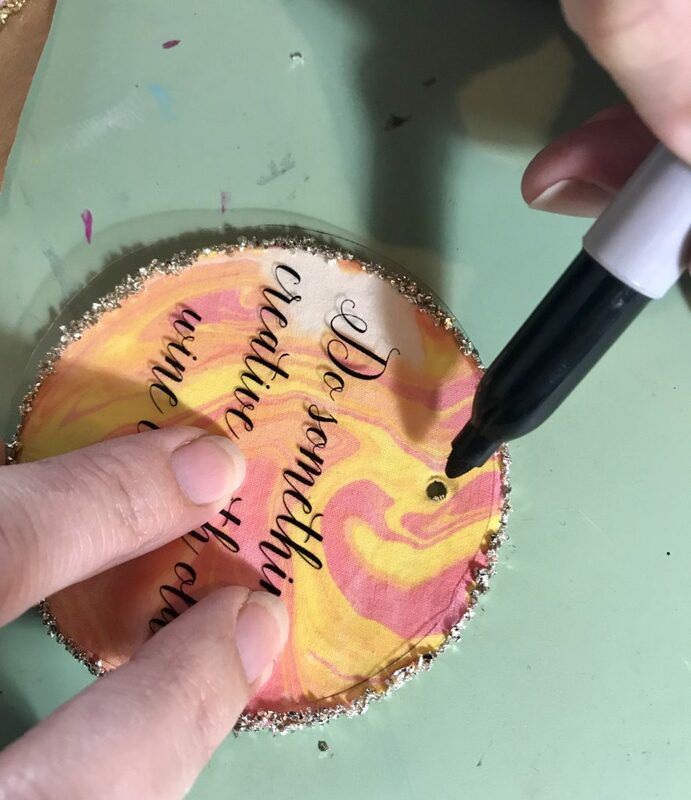 There are endless possibilities, but simply by being creative and bringing your inspirations to life, you are already on the way to making them happen! 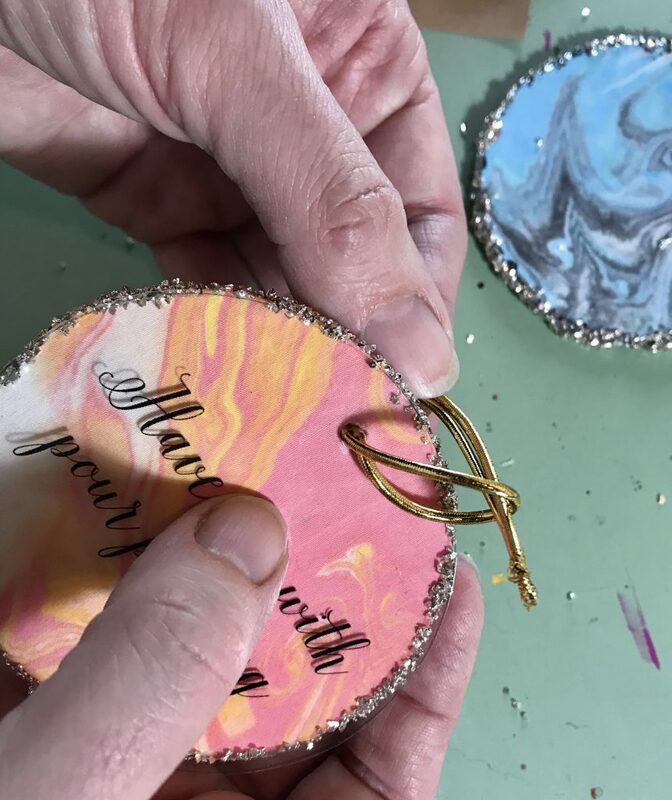 Use your chipboard circles to trace onto the backside of a variety of pretty papers or fabrics. 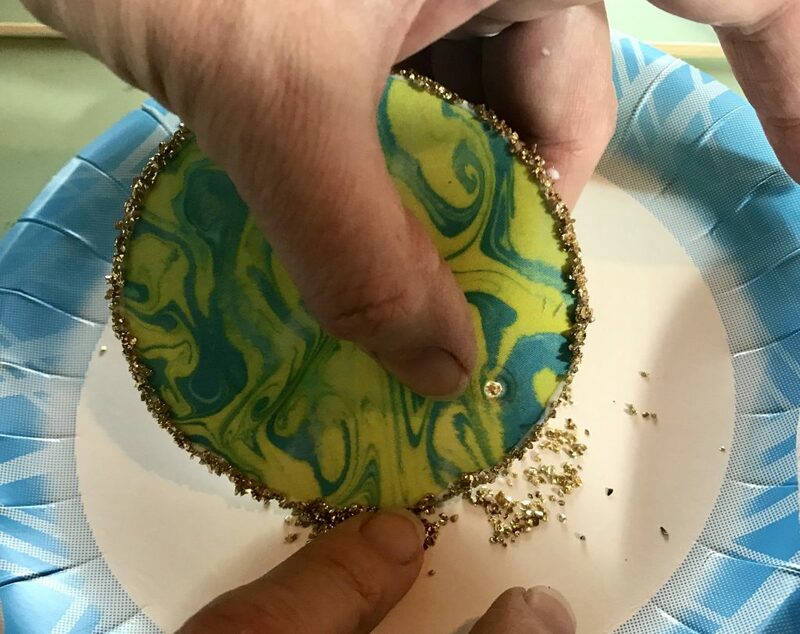 We chose to marbleize our own fabric for our ornaments. 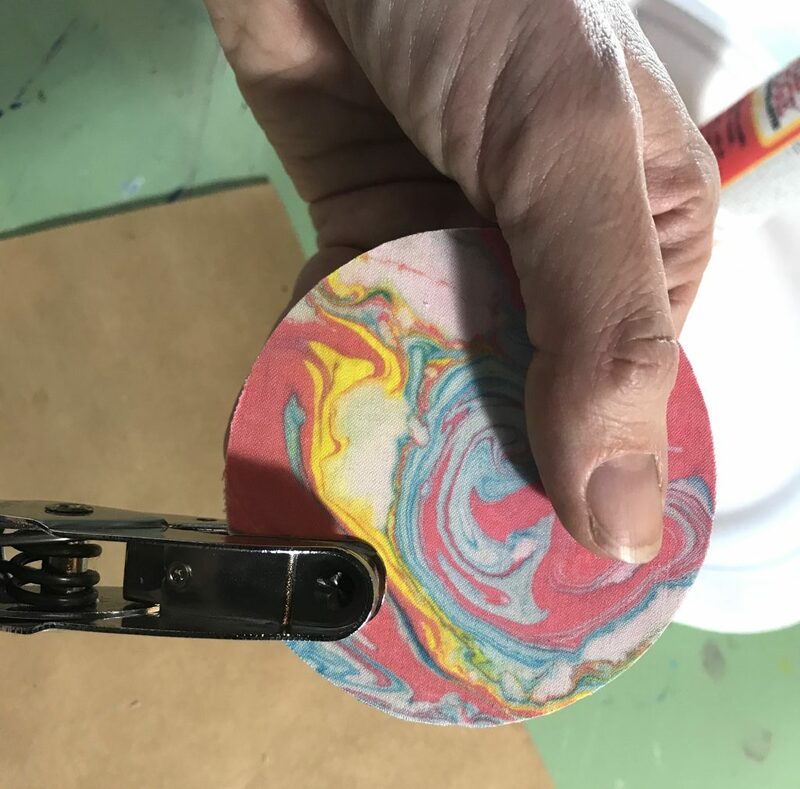 Here’s how to marbleize. 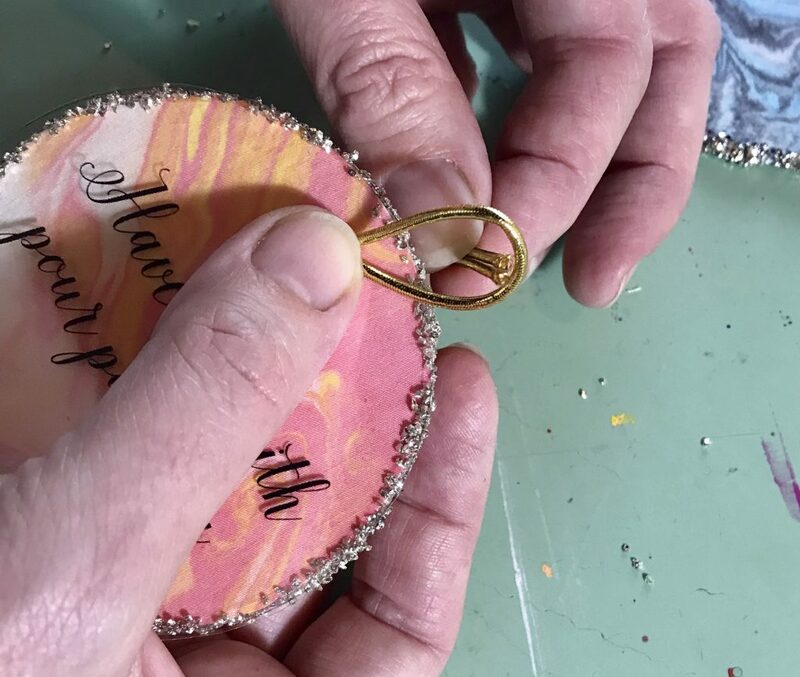 Cut out two circles for each ornament – one for the front and one for the back. 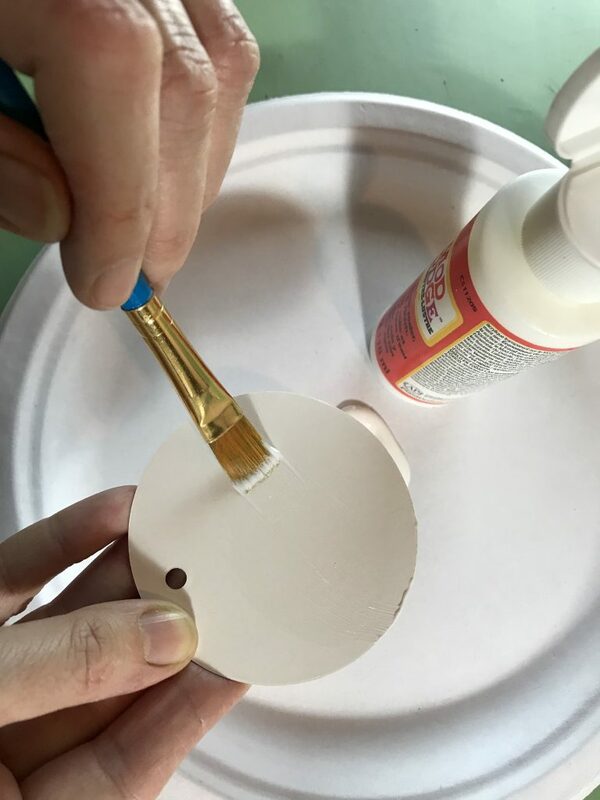 Use a paintbrush to evenly paint glue onto the cardboard circles. 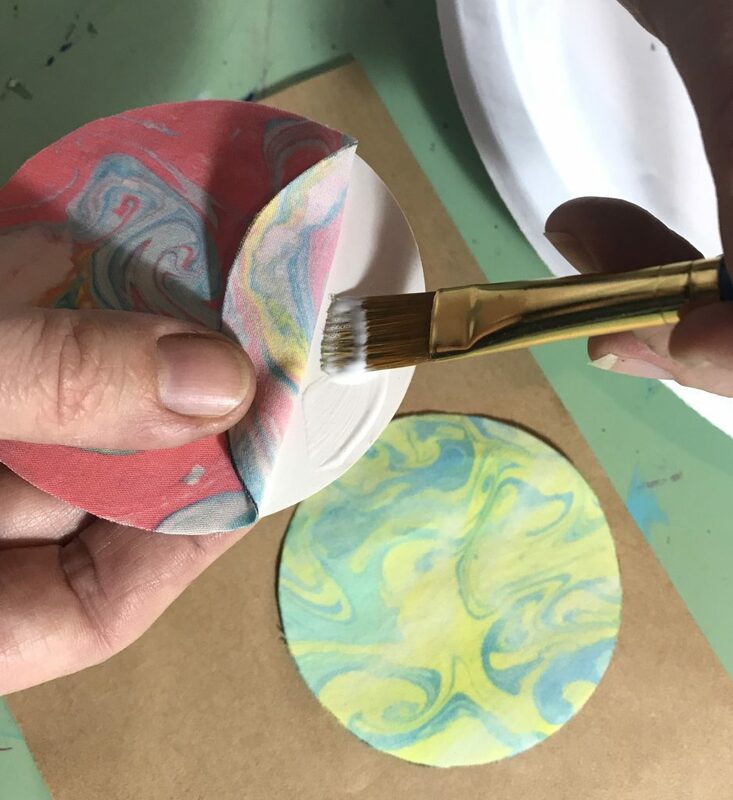 (tip: wash paintbrush with soap and water before glue dries to get brush clean). 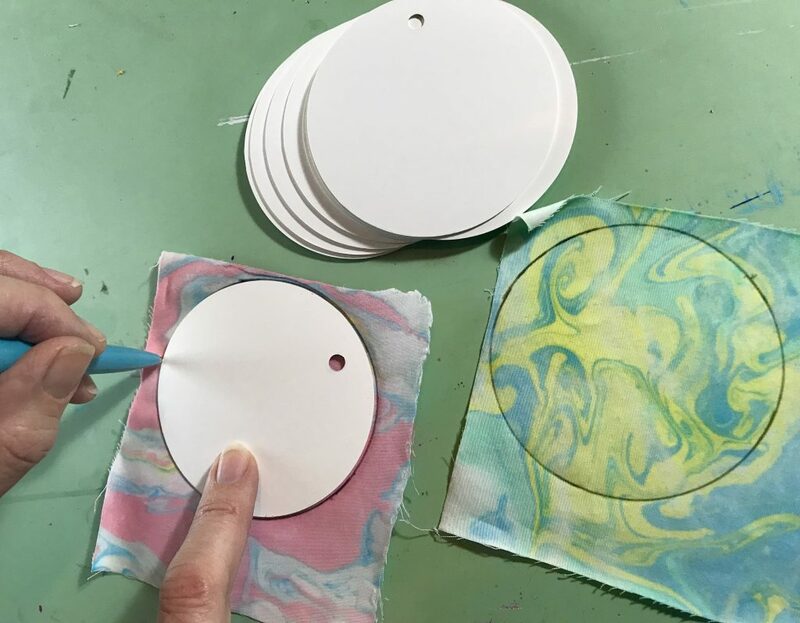 Affix a paper or fabric circle on each side. Make sure edges are fully glued down. Then trim any excess fabric. Find the hole in the chipboard and depress fabric or paper to guide you for punching the hole. Use a stylus or skewer to push punched hole out cleanly. 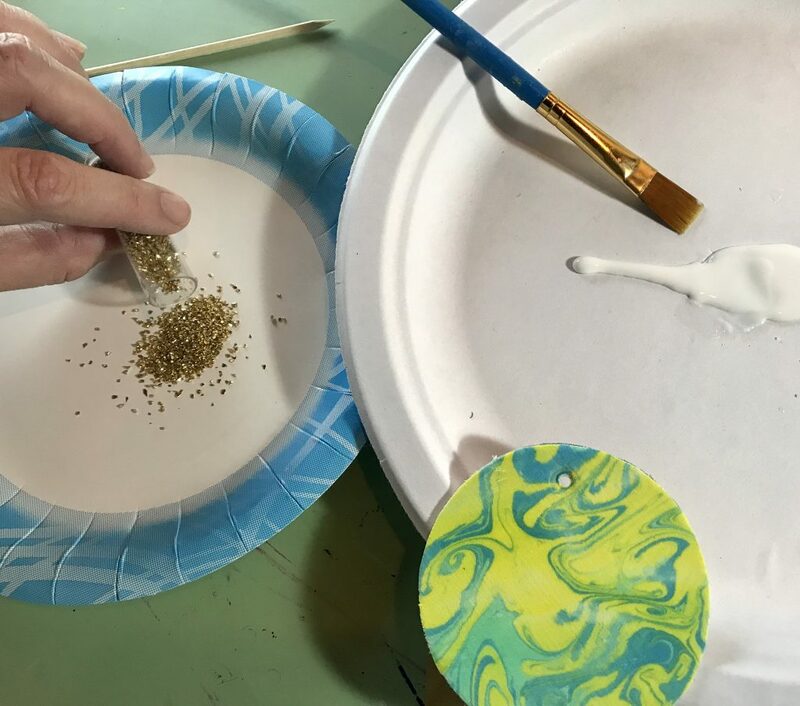 Pour glue in one plate and glitter in another. 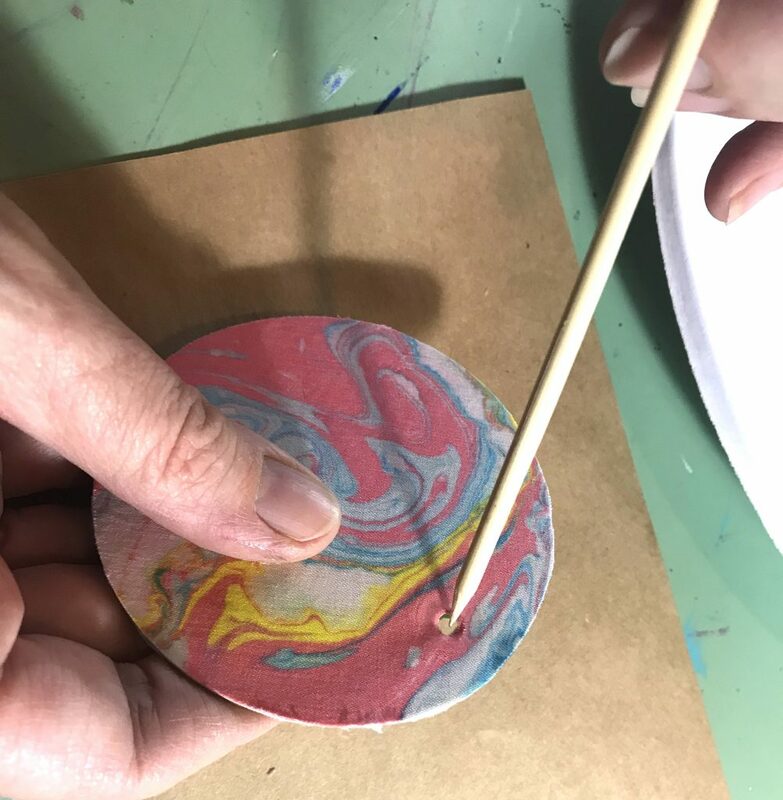 Carefully roll edges of ornament to evenly coat in the glue. Then roll edges evenly in the glitter. 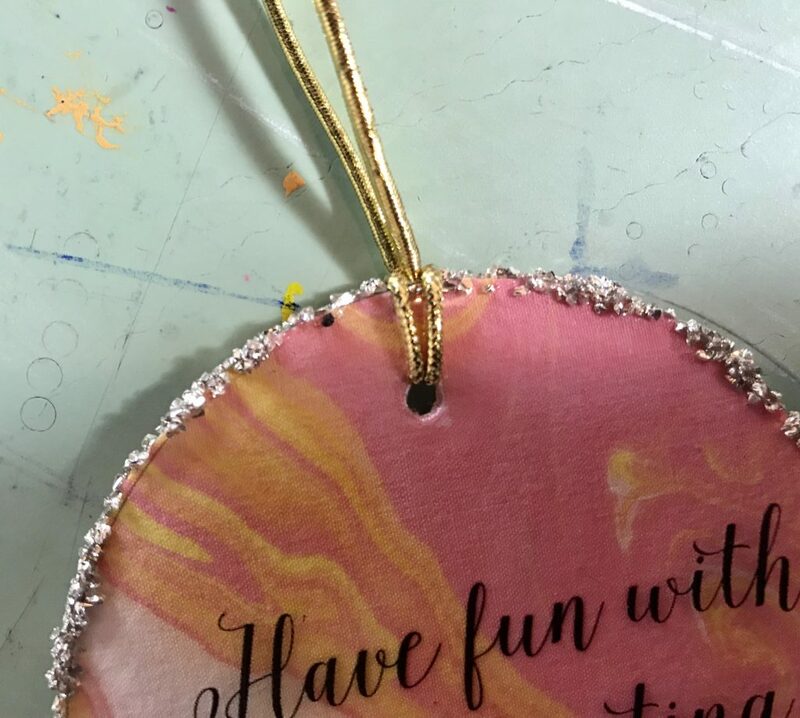 Allow edges to dry before next step. 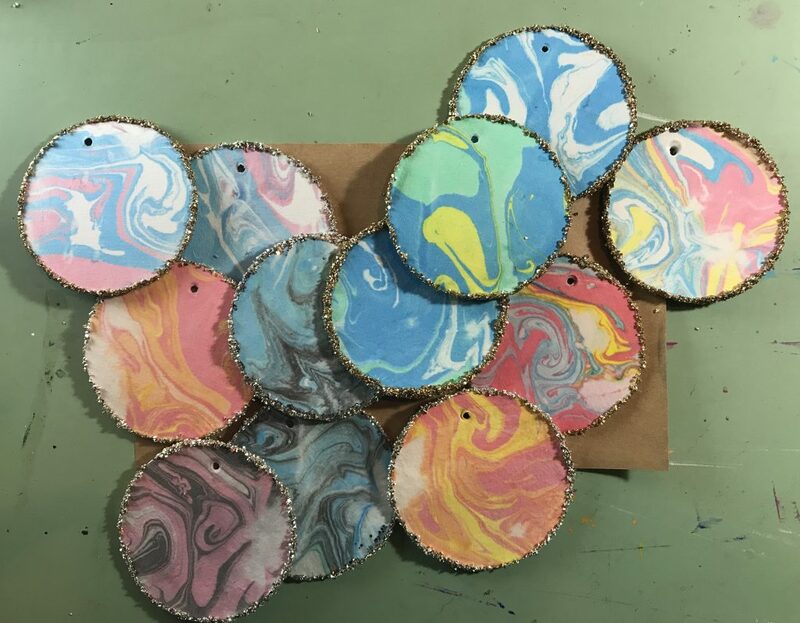 Dried decorated circles ready to go. Pretty! 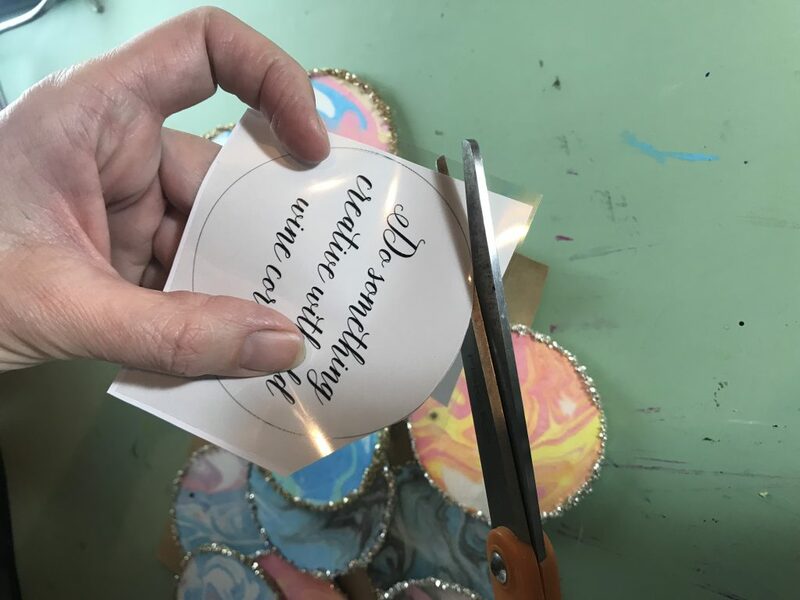 You can hand write your sayings or print them out directly onto the transparency paper. 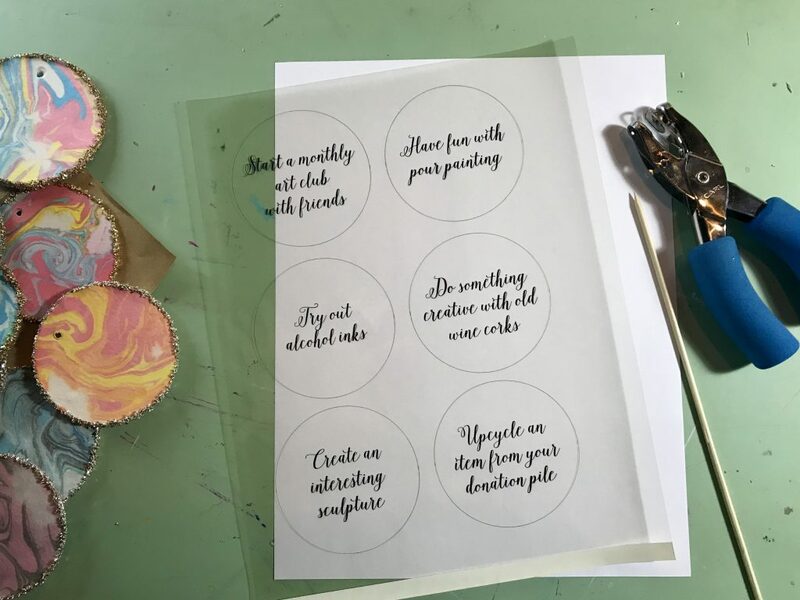 Choose a font and make sure your saying fits into a 3” circle. (We chose the font Isabella). Print your quotes on transparency film. 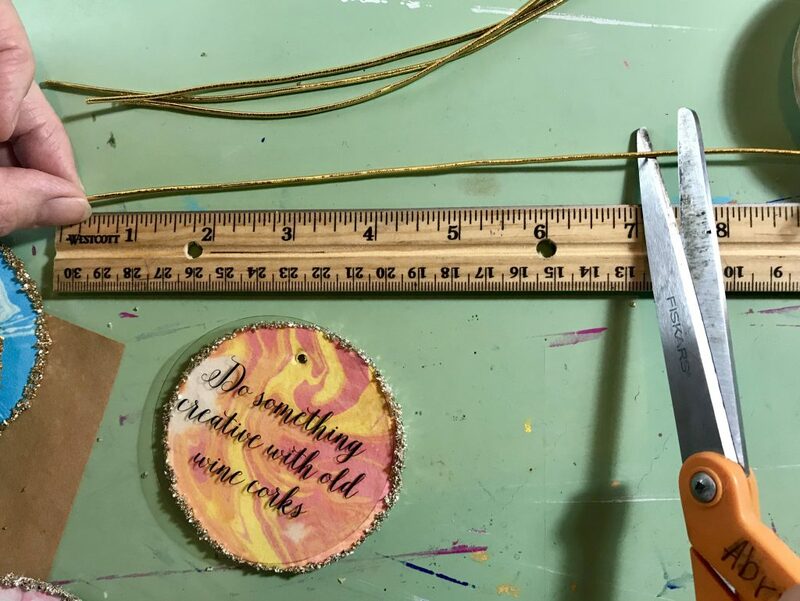 Trace around the chipboard circle to indicate cut lines. Cut the circles out. Tip: it helps to put white paper behind the transparency as you cut so you can see it. 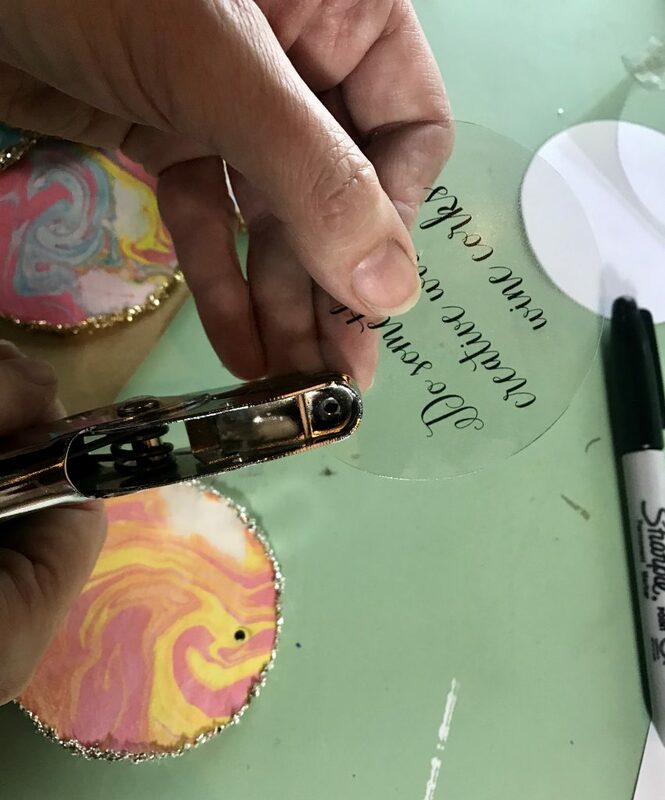 Line up transparency circles with covered chipboard circles and use a sharpie dot to indicate where to punch hole on the transparency circle. Punch hole in transparency circle. Step 7: Add Ribbon And Hang! Stack both circles so the holes align. Cut cord to about 7 inches. We recommend using a slip knot when you add the cord. 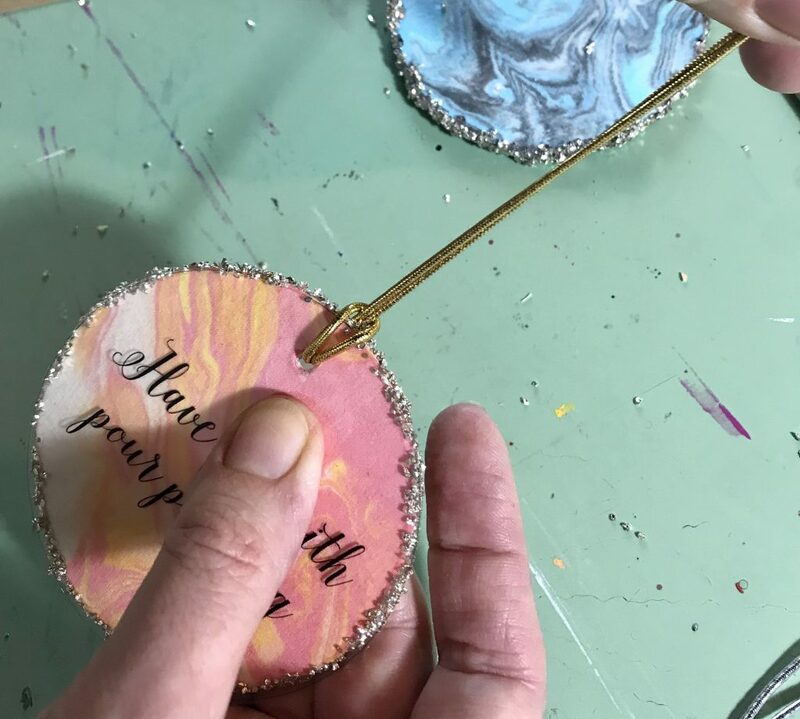 Slip knots help the ornaments to hang straight. Here’s how to make a slip knot. Display your ornaments on a tabletop tree and be inspired every day to reach your goals! Argos helps us display our Creative Goals Vision Tree!